I’ll be honest here that I rearely use a pack of this size. As a wannabe ultralight hiker this pack is way above my pack size needs. So why then do I own one? It wont surprise you to know that I actually own a total of seven packs currently and use all but two of them to varying degrees depending what I’m doing at the time. I must admit that my Aether 70 litre pack doesn’t get as much use as it once used to as I progressively replace my gear with ultralight versions that are lighter and more compact. Having said that I’m loathe to let this pack go as on rare occasions I do carry either loads that are heavy or if not heavy, bulky an as such require a high capacity and durable pack. The Aether pack is essentially a mens pack but with specific womens packs being a new idea (relatively speaking) these packs aren’t just for men. In fact as a woman purchasing a pack I wouldn’t rule the Aether out when choosing packs with the criteria being fit an comfort first. This large capacity pack has one main compartment that can be divided into two to seperate ones to store your sleeping bag and rain gear which can be accessed through a bottom zip pocket without having to rummage through the entire pack. Osprey are widely considered the worlds largest manufacture of hiking packs and they have this market share for a number reasons including the high quality of their products. This high quality and highly durable pack comes with a price and that is the pack weight which means that the Aether for my frame size (large) is 2.3kg. But this durability and build quality means that it will handle much heavier loads (27kg) than my current go to pack the Osprey Exos 48 which would collapse under that weight ( as would I). I don’t ever want to carry that sort of weight but I have the option if I so choose. The Aether features Osprey’s IsoForm5 harness and its Custom Fit hip belt which you can have moulded pacifically to you in store in the special Osprey oven or just let it mould to your body through wearing it. Both these features contribute to ensuring a great fit with heavy loads and over long distances. These components are both interchangeable to ensure a customised fit. The hip belt carries most of the load and this broad padded belt is very comfortable meaning that you don’t need up with buried hips unless you are carrying excessive loads. I have carried some big loads with this pack over long days and this pack sticks to your body and feels very stable. The trampoline style frame keeps the pack off your back and allows airflow so gone are the days of a sweaty back in all but the rarest conditions. Another negative of this pack is that doesn’t perform well with very light loads and looses stability with out at least some weight to keep the pack stable. If you are going to be carrying light loads all the time then this is probably not the pack for you. The Aether has good sized pockets on the hip belt – big enough for snacks, and even my compact camera or phone. The Aether currently comes in three sizes 60,70 and 85 litres and a variety of colours depending on what the stores chooses to stock. The pack brain is removable from the main pack and becomes a small carryall – or in Osprey’s language a DayLid – that you can load up with goodies for that short walk or side trek. This pack has no shortage of pockets. The large stretchy pocket on the back is ideal for holding rain gear and warm jackets. The two side pockets hold typical Nalgene style water bottles or other similar sized equipment. The Aether has plenty of compression straps that allow you to cinch down the pack to a compact size as well as an external bladder pocket which means removing and replacing your bladder is an easy task that doesn’t require you to pull everything out of your pack to top up your water. One other feature that I really like is the ‘stow on the go’ trekking pole storage which allows to to deploy/or put away the trekking poles without having to stop. This feature took me a little while to master but I am not sold on it. 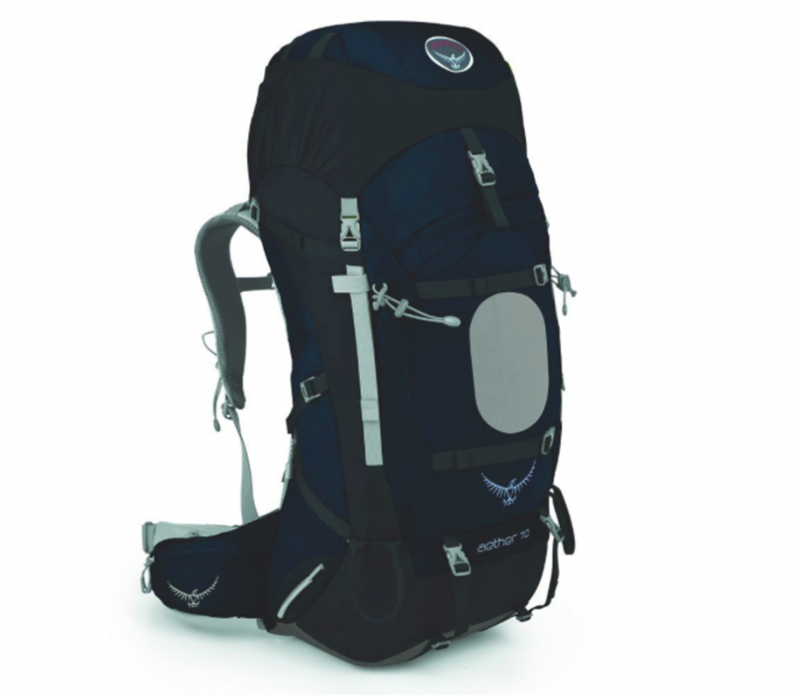 Osprey in in the process of releasing an 2017 version of this pack which will available on the Australian market in the near future . The new model will come with an Anti-Gravity harness seen on select models of the pack over the last few years. But it you want an excellent quality robust large volume pack then now is the time to take advantage of the close out sales as the Aether 70 litre can cost up to $390 AUD normally but can be found as cheap as $255AUD. Now is the time to shop around and get a bargain on a great pack. Removable top lid which you can use as a separate carry all providing versatility in your hiking.